There is no one macular degeneration test, but rather several ways that your eye care professional can determine if are at risk for developing macular degeneration or if you have macular degeneration. A macular degeneration (AMD) eye exam includes several different tests. 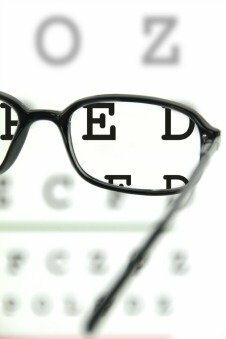 The first test in a comprehensive eye exam is a Visual Acuity Test. This test simply tests for the sharpness of your vision. The most common one being the Snellen chart which is the familiar white chart with black letters. How often you should have a general eye exam depends on your age, if you currently wear prescription glasses and if you have any eye diseases or other health conditions. "Get a comprehensive eye exam if you have risk factors such as diabetes or a family history of eye disease. Get a baseline eye exam by age 40, even if your vision seems perfect. 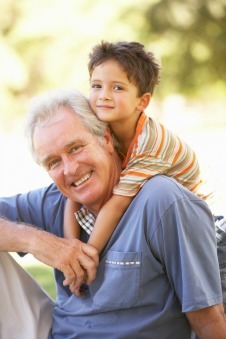 Schedule an eye exam every 1–2 years if you’re age 65 or older." Be sure to ask your eye doctor if any changes in the retina were found or if any macular drusen were present. The Amsler Grid is a macular degeneration test that checks for any distortion or wavy lines, which are symptoms of AMD. A person with normal vision will see all straight lines. A person with wet macular degeneration sees something like this illustration - the lines are wavy and distorted. They may also see a "hole" in the middle of the macular degeneration grid. The doctor is assessing the macula (the center of the retina) when testing your vision using the Amsler Grid. 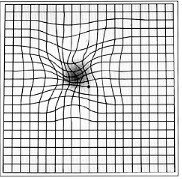 A patient diagnosed with dry or wet macular degeneration should have an Amsler grid at home to monitor their vision. If any changes are noticed, notify your doctor right away. During your routine eye exam, a retina exam is always included. A new technology allows the back of the eye to be seen in a wider view and in a way that captures a digital picture. The digital picture can be saved and then used for comparison when future exams occur. Once a person has been diagnosed with AMD, their vision needs to be monitored. An at home macular degeneration test, called the Foresee Home Monitoring Program uses a technologically advanced device that can detect vision changes much earlier than one can with an Amsler Grid. 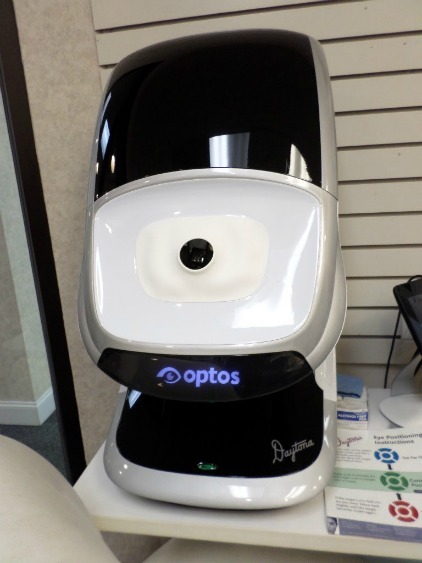 Research has shown that this FDA approved program resulted in earlier detection of symptoms that are associated with the development of wet macular degeneration. Recent FDA clearance means that this macular degeneration test will soon be available by prescription from your eye doctor. More sensitive in detecting visual distortions and changes than the Amsler Grid, vision testing is recommended only twice a week rather than every day. 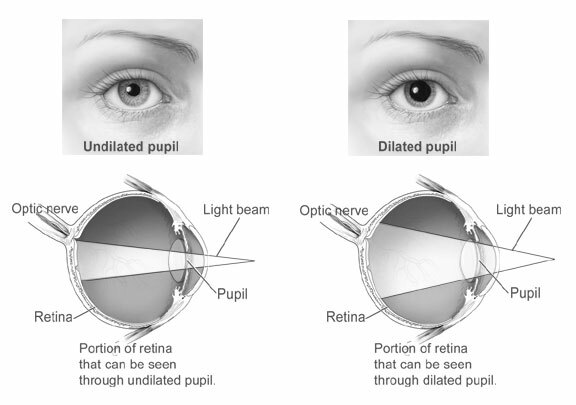 Your pupils are dilated so that your eye care specialist can get a fuller view of the retina. Special drops are administered to dilate the retina. The drops take about 20-40 minutes to work - but it takes about 4 hours to wear off. Bring sunglasses to wear for your drive home and remember that you may not be able to read for a couple of hours. After your pupils are dilated, the physician has you sit at a device called a slit lamp. The slit lamp provides a magnified image of the structures of the eye which helps with a thorough evaluation to detect signs of infection or disease. When used with special lenses, the slit lamp gives the examiner a highly magnified view of the retina. This is when the examiner will look for drusen. 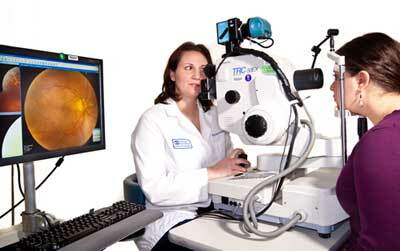 A camera can be attached to the slit lamp to take photos of your retina. Drusen are small yellow or off-white deposits that form in the tissue layer underneath the retina. The appearance of drusen near the macula is one of the most common early signs of macular degeneration. It does not necessarily mean that you have macular degeneration, but it does mean that the eye is at risk for developing AMD. Drusen can be present in the eye for years without affecting your vision. These signs would suggest choroidal neovascularization (CNV)or wet macular degeneration. In these cases, further testing may be necessary. Did you know that a genetic test is available for those at high risk for developing age related macular degeneration? Dr. Edward Paul, a low vision optometrist with a specialty in Age-related Macular Degeneration (AMD) reports that, " Genetic factors alone account for 63% of the disease risk for AMD." In this e-interview he tells us if you should be tested, what is involved and what information this test will provide. Measuring the density of the macular pigment provides important information about one's risk of developing age related macular degeneration. 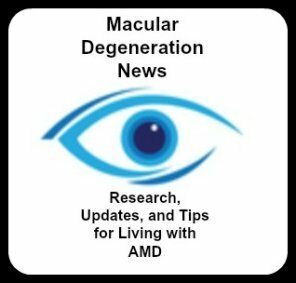 Low Macular Pigment Optical Density (MPOD) is a key risk factor for Age-Related Macular Degeneration (AMD). 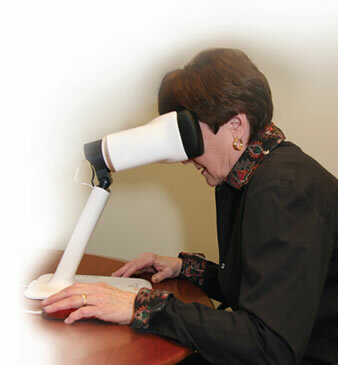 QuantifEye is a scientifically-proven instrument that measures Macular Pigment Optical Density (MPOD). Fluorescein angiography or angiogram evaluates the blood vessels of the retina and helps to make treatment decisions for macular degeneration. It is most useful in diagnosing choroidal neovascularization (CNV) or wet macular degeneration. A dye is injected into an arm vein which then travels through your blood stream to your eye. You may get a warm feeling or experience a hot flush. This only lasts seconds and then disappears. Photos of the retina are then taken over a period of about 60 seconds as the dye enters the vessels at the back of your eye. The ophthalmologist can see if the dye leaks from any of the vessels to determine if and where new and fragile blood vessels have developed. 5) Multiple pictures are taken of the retina. The dye gives the blood a glowing appearance so that the location of leaky vessels can be determined. Why is this test given? 2) To determine the exact location where a leak is to guide any kind of laser treatment.